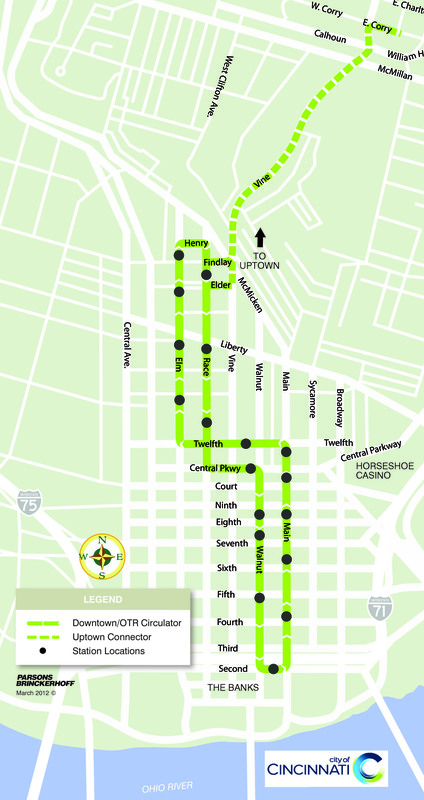 Phase one of the Cincinnati Streetcar will run from Second Street at The Banks all the way to just north of Findlay Market at Henry Street where it will turnaround and head back south toward the Central Business District and the riverfront. The first phase of work will include 18 stations and is expected to attract roughly 3,000 daily riders. Initial planning for the second phase of work has already begun, and will take the Cincinnati Streetcar from Findlay Market in historic Over-the-Rhine up the hill to the University of Cincinnati and uptown neighborhoods. The final route and funding for this phase of work has not yet been determined.